WigSalon gets calls from wig makers to try and promote their wigs all the time, much like OverStock.com. We have decided that when the deals are good enough we let our clients in on them. These are brand new wigs, usually in the process of being discontinued, which happens in all fashion businesses to make way for new designs. Wigs by Pierre of California has four beautiful mono wigs that are nearly sold out. One of them is lace-front. These sell as high as $295 on the Internet ... we just checked. This special will be run until December 2nd. Wigsalon.com 's World Premiere of five new instant classics from Gabor. Eva Gabor's Plus Color Series are specially designed for vibrant mature women. They are basically conservative styles but updated and never boring. The Plus Color Concept is to lighten the hair at the bangs and have it remain darker at base of the neck. This is how natural hair appears, adding realism to these perfected styles that are light-as-a-feather and so comfortable for serious daily wear. All five styles are ultra-light , weighing under 4 ounces... Even the lace fron mono styles! 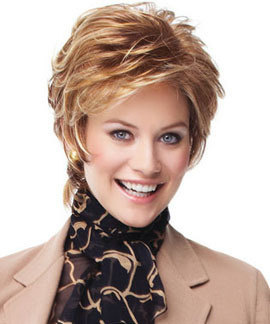 More smart women are becoming mindful of the value they get from Eva Gabor Wigs. Her wigs have been around since the '60's - and keep getting better.